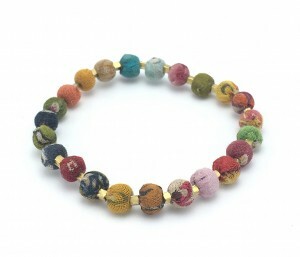 Kantha Dot Bracelet, featuring tiny beads of recycled Kantha textiles interspersed with golden seed beads. The bracelet is perfect to wear on its own or layered with other pieces. 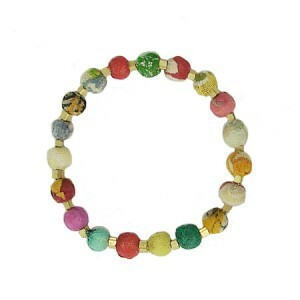 Measures 1/4” at widest point; bracelet is adjustable to fit most wrists. As these are handmade from repurposed textiles, colors and patterns will vary. Handmade by marginalized women artisans in India who are improving their lives through fair trade. Be the first to review “Kantha Dot Bracelet” Click here to cancel reply.